Home » personal » Kaddu on "the Leash"... again! huh ..is that ur pic..why do u consider cell phone as a leash rather than a communicvation device.Do you have as many ppl calling you as they do to me.You have no idea sometimes I wonder if i get as many calls as a call center guy would get till 2 am in the night n all talking about their problems n how bad they felt and what can they do about it. 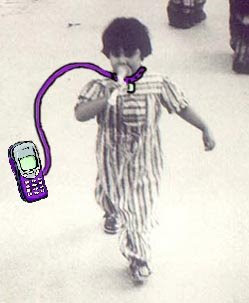 At least you dont have that stuff to deal on phone so be happy n stop creating this kind of pictures where you make cell phone as a leash on a baby's neck. Think it as acommunication device..which sometimes gets invasive n irritates you but is good to contact otherwise. n ya congrats on the 200th post. Well it's more or less the same... I get calls mostly to help ppl fix up their computers! And it's not "a baby's neck"... it's my neck! Ha ha! The last para... well, yeah... I get really emotional abt that... so I try not to pay attention to tht kinda stuff anymore, since I really can't do much abt it right now anyway! Thanks for visiting my blog and the comment. I went ahead to vote for you but decided against it thanks to lack of time! May do later (after 7 June if the deadline remains; you can remind me). actually I chose this URL bcoz Im doing one of the Affiliate Program, called GDI. But later on I get myself involved in blogging. I worked a lot on this site, like SEO and all. That's y I stick with this URL. Wil let u knw when get a new 1.
well i arranged all my articles according to sections and categories. So the surfer get articles on their screen related to current article. Anyway I put GDI Affiliate Program's link on the top module. looking forward to ur upcoming articles. :-p Never thought I'd make it so far & so long into blogging! "Marching" for sure! I look like a kid with a mission!